At this joyous time of year, we are excited to share some updates on investment activity in Thailand. In 2018, BOI has launched multiple initiatives expected to yield a "Golden Year of Investment" for Thailand in 2019. First of these is a new incentive package, intended to boost investment to Thailand's knowledge-based industries. The program, which took effect on November 19, 2018 and runs through the end of 2019, includes a 50% reduction of corporate income tax for three years. More information on this program can be found in the links section below. 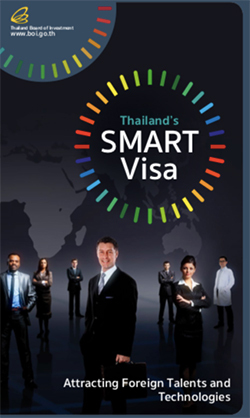 The Thai government has also improved qualifications and criteria for the Smart Visa, in order to provide greater convenience for foreign investors and experts in targeted industries who are either already working or seeking to work in Thailand. The new Smart Visa expansion offers more benefits for Smart Visa holders, and more flexible qualification criteria for applicants. More information on the Smart Visa expansion is available below as well. Below, I've included some recent industry news from Thailand you may find interesting. BOI Thailand wishes you and your family abundance, happiness, and peace in the coming year. Happy Holidays and Happy New Year! The Thailand Board of Investment (BOI) announced a new investment incentive package as well as an expansion of the Smart Visa program. Thailand earned 38th place in this year's World Economic Forum (WEF) global competitiveness index 4.0 rankings of 140 nations. The Board of Investment (BOI) agreed to improve the qualifications, criteria and incentives for the Smart Visa, a special visa issued to highly-skilled experts, investors, senior executives and startup entrepreneurs working in targeted industries. The cabinet has endorsed four infrastructure investment projects worth a combined 470 billion baht under the government's flagship Eastern Economic Corridor (EEC) scheme. BMW Group Thailand has set its sights on another milestone in Thailand's journey towards a future of electro-mobility with local high voltage battery production – at a new production facility located in WHA Chonburi Industrial Estate 2. Japanese carmaker Mazda Motor Corporation is poised to produce hybrid electric vehicles (EVs) in the country after the Board of Investment (BoI) granted a 11.48-billion-baht investment application. Mercedes-Benz Thailand is studying the possibility of applying for Board of Investment (BoI) incentives for battery electric vehicles after winning privileges for two related projects, plug-in hybrid EVs and lithium-ion batteries. Toyota plans to bring forward its investment in its Thai hybrid vehicle battery plant by a year citing potential shortages of batteries in Japan, according to local reports. The $70 million investments are part of the company's global innovation strategy to leverage technology, in support of the needs of partners and customers. The Dow Chemical Co (Dow) announced the opening of a new world-class polyol plant for rigid polyurethane foam in Rayong, Thailand. Zurich-based technology provider ABB is teaming up with King Mongkut's Institute of Technology Ladkrabang (KMITL) to promote robotics education in Thailand. Both parties signed an agreement to foster cooperation and put in place a framework that facilitates R&D.